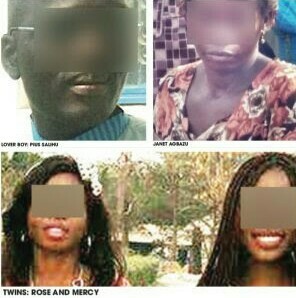 Life has become a conundrum for a Nigerian woman, 45yrs old Janet Agbazu and her 16-year-old twin daughters who found themselves in a mess that beats many other absurdities. What’s worse, the villain, identified as Pius Salihu was literally a member of the family – the mother’s live-in lover and for two years, a father figure to the 16-year-olds. Presently, the three women, forced by fate to play actors in this drama of the absurd, are covered with shame. As for the villain in the plot, he is at large. Pius Salihu moved through the family like a hurricane and reduced the lives of the three women to ruins (with their consents), leaving them with regrets and recrimination and a very big problem that is now a Gordian knot for the family. The couple had their first childbirth two years after their marriage and after the ‘double blessing’ of twins, they never had another child – not for lack of trying, though – until the tragic death of Anangba in 2013. But the family found themselves in a precarious position when relatives of their late breadwinner confiscated his properties – including a house and three cars as well as cash and other belongings. Daily Sun got a hint of the development on August 13, 2018, and effort to interview the family brought the reporter in contact with Mr Clement Nuanga, an uncle to the beleaguered mother of the twins. Nuanga lives in Toto and the three victims had relocated to his house in their quest for a solution to their problem. On August 14, the reporter travelled to Toto Local Government Area, a six-hour drive away from Lafia. The reporter had an interview with Janet Agbazu, who narrated the ugly, sad development to Daily Sun in the presence of her uncle. “In 2016, I went into a blind relationship with one Pius Salihu, an Igala man. I was blinded by love, deceived by his fine face. I did not bother asking him to take me to his place. Though three years younger than me, he appeared to be an honest and a humble man, I accommodated him and moved him out of his friend’s house to come and stay with me. I had not met a man s*xually since the demise of my husband years back, that also contributed to him getting me so cheaply. “My daughters were old enouhg to appreciate that I needed a man in my life. I also assumed they were responsible enough to see him as their father. I thought I could trust him, so I gave him all the liberty he deserved in my house. Unfortunately, I miscalculated. Unknown to me, while he was sleeping with me, at the same time, he was having affairs with my two daughters separately. These are small girls that were not exposed s*xually. He enticed them with petty things and he got them easily. He was very close to them, so he got them cheaply by taking them out regularly. He also involved them deeply in the activities of the NGO he was running in the state. Sometimes, he would bring up a fake journey to Makurdi or Abuja. He would not travel with the two of them at the same time. Unknown to me, he was secretly enjoying my daughters right in my own house, and my daughters foolishly bought into his deceit”. “The s*xual inter-course they had with him was as a result of ignorance and lack of s*x education; if they know better, they won’t have done it,” said Nuanga.